He hoists the barbells under the watchful eye of his trainer. Spark plugs form the powerful bodies. 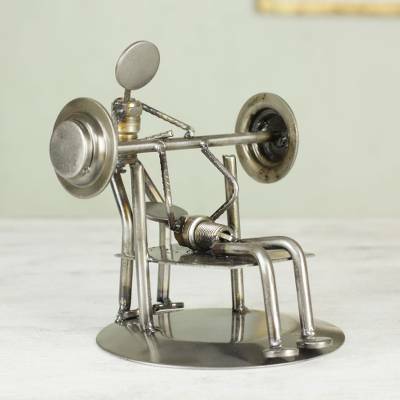 These muscular weightlifters are crafted from an amazing assortment of bicycle and automobile parts. Armando Ramírez recycles them as rustic art. You can find iron statuette 'Rustic Weightlifter' by Armando Ramirez in sculpture categories such as Eco-Friendly Sculpture, Recycled Metal Sculpture, Sports Sculpture and Metal Sculpture. Enjoy exploring these sections for other Novica treasures. This item is uniquely awesome!